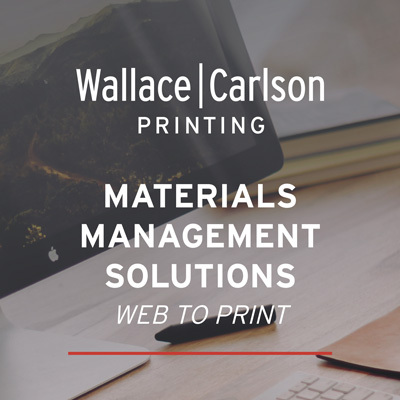 What is a Web to Print Materials Management Storefront? Storefronts are customized online web portals that make it easy to access and manage all of your company’s branded materials. Your custom Web to Print Portal is available to you 24/7, making it easy to access & manage all of your company’s Branded print and marketing materials. Tailored to your company’s individual needs, this web portal enables you to quickly order and release print inventory and print-on-demand items such as catalogs, brochures, folders, sell sheets, promotional products. A customized solution gives the control you need to approve, edit, or disapprove orders placed on the system. Spending less time dealing with logistics allows for more time to be spent on the creative and financial demands of your business. Enables clients to more easily manage their print budgets, generate usage & inventory reports, free up valuable space and simply get organized, saving both time & money. In addition, and most importantly, protect their brand. Acting as the keeper of the keys, you have the control that you need to approve, edit or disapprove orders. Spending less time dealing with logistics, ordering, approving items, and more time with the demands of your busy position. Ultimately, Web to Print enables you to better serve both your internal & external customers. The team at WCP are experts in post-print materials management. Whether its complex kitting and fulfillment, distribution programs or inventory management, cost effective execution of your requirements are critical to your success. We create value for our partners by increasing efficiencies through optimizing production work-flow and reduced touches which help to speed up turn times and lower costs. Get Organized- Users from various Departments, Cost Centers, Locations, etc. can view & order only the items assigned to them. User Friendly- Enables end users to quickly locate and order inventoried items or create, proof & order the Print on Demand marketing collateral that they need, all while staying within your corporate branding guidelines. Version Control- Only approved versions of your marketing collateral or business documents are available through your site. Approval Levels- Multiple approval levels & rules can be applied. Time to Market- Speed up the entire process and quickly deliver your marketing collateral. Speed Thrills- 24/7 access to inventory & POD marketing collateral, regardless of time of day & where you are located. Brand Identity Protection & Management are critical to every organization and this task can be achieved with a managed WCP web solution. Version Control- Only the latest approved versions of your printed marketing collateral will be available to users on your Web to Print Site. Obsolete versions of marketing collateral can easily be removed or deactivated, ensuring that only up to date print collateral is available to your users. Revision and/or Reviewed dates can be listed in the product description, making it easy to identify dated items that may need to be revised & refreshed. Compliance- Conforming to corporate marketing & purchasing guidelines can be made easier, regardless of where users are located, by ordering marketing collateral through your Web to Print Site. This of course will help reduce both the amount of boot leg collateral that is created & the misuse of your company’s logo. Variable Templates-Locked down branded areas of your marketing collateral are created to provide the brand consistency that you need, yet allow for variable or personalized information to be added as well. Mass Adoption- Driven by ease of use, a unified ordering process can greatly improve your company’s ability to service both internal & external clients. Marketing executives act as approvers and can easily approve, edit or decline variable orders that are submitted by users. As an approver, you will have all of the control that you will need to properly manage your company’s brand. Order, print and distribution- Orders can be easily entered through WCP’s Web to Print System with pre-defined attributes. Whether through our internal distribution channels or in our USPS mailing operation, orders are processed and shipped to meet your requirements. Variable Data Printing- Create VDP templates in order to personalize select areas of your marketing collateral such as Names, Addresses, Offer Amounts & Codes, Expirations Dates, Images, Locations, etc. Your personal and custom storefront portal offers a wide variety of reports that are available to you 24/7, all of which can be easily downloaded and saved as an excel file. Listed below are some of the more popular reports that you can generate on demand.